The new year is right around the corner and with it comes changes in fashion. If you are planning to get married in 2009, look for things to be bolder and brighter. Though you don't have to follow the trends exactly, they will give you a general idea of what's hot and what's not. Then you can incorporate a little bit of the latest trends into your own personal style. Over 20% of all weddings are now destination weddings. And what's the most popular destination? The beach! No matter if your wedding is taking place in the heart of the city or on an exotic isle, tropical colors are one of the hottest wedding trends. Look for bridesmaid's dresses in aqua blue complemented with orange or yellow accents. The bride herself can also get into the act by adding a bright blue sash or bold, colorful jewelry on her wedding day. The tropical influence doesn't end with attire. Many couples are bringing in tropical flowers, such as bird of paradise, red ginger, calathea and other orchids, for their bouquets, centerpieces and wedding decorations. Tropical cocktails are the drinks of choice, particularly Mai Tais and Blue Hawaiians. As the world continues to go green that carries over into bridal fashion as well. Look for wedding gowns and bridesmaid dresses made from organic cotton, vintage silk, hemp, bamboo, soy and recycled materials. Despite what you might think, eco-friendly bridal gowns can be very beautiful. Take a look at designers such as Deborah Lindquist who has created a gorgeous line of eco-couture gowns like the one pictured here. Threadhead Creations, Rene Geneva and Get Conscious also offer beautiful choices in green wedding gowns and of course Canada's own Adele Wechsler with her 2009 Eco-Couture collection. Another way you can be earth-friendly is to choose a used gown rather than buy a new one. Rent a dress or shop at vintage clothing stores to find beautiful, gently-used gowns. For more tips on planning an eco-friendly wedding, check out our 10 green wedding ideas. When you were growing up, you probably pictured yourself getting married in a beautiful, ball gown with a puffy skirt down to the floor, or a more fitted, full-length dress with a long, luxurious train. But wedding dresses don't have to be long. In fact, in recent years, tea-length or short dresses are growing in popularity. Though a cocktail-length dress above the knee might not be suitable for a church wedding, a tea-length dress is certainly appropriate. Just a few inches above the ankle (not quite up to mid-calf), tea-length gowns are a little unique and a great way to show off a fabulous pair of shoes. You can also select a gown that is higher in the front and longer in the back, such as the Alfred Angelo gown pictured above. For an outdoor or more informal wedding, you can go even shorter. 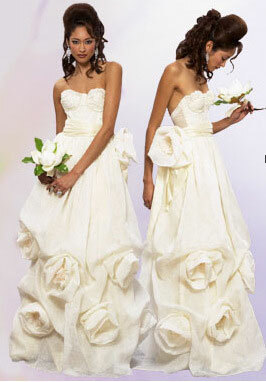 Many brides are selecting wedding gowns that fall at or just above the knee. In terms of length, whatever you feel comfortable wearing is acceptable. Just don't wear a dress that is so short that you constantly have to worry about pulling it down. Pink has always been a popular color in terms of bridesmaid dresses, but over the last few years in has grown in popularity for bridal gowns too. 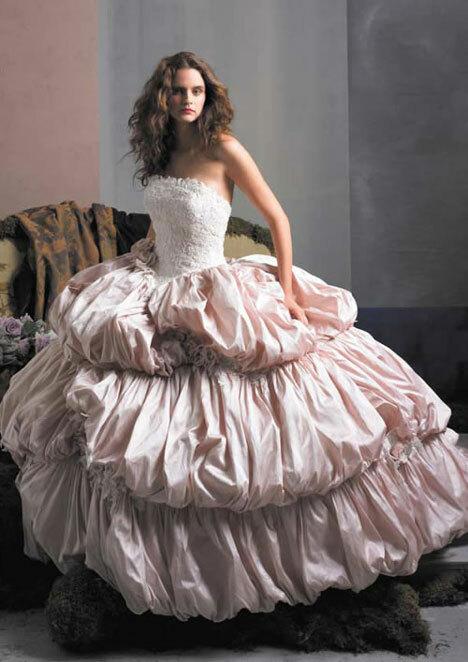 Wedding dresses in all shades of pink are available from some of the top bridal designers. Whether you are look for a pale shade of pink or something more bold and vibrant, you are sure to find something pink that is suitable to your taste. When wearing a pink bridal gown, don't over do the pink throughout the rest of your wedding. Instead of having your bridesmaids wear pink too, consider having them don dresses in a more neutral color such as cream, brown or even black. To tie into the color of your dress, they can wear pink shoes or pink accents. Other hot trends in wedding fashion for 2009 including red wedding gowns, metallic shoes and orange bridesmaid dresses. Whatever colors and styles you choose for your wedding, don't rush when you are shopping. Take your time and enjoy the experience of picking out your bridal gown. You will know the right dress for you when you see it.